Thank you! Thank you! Thank you! I have been looking for quite a while for the Below Decks Wallpaper and it is in The Curio Shop right now. Yes!! I just bought four (only needed one). 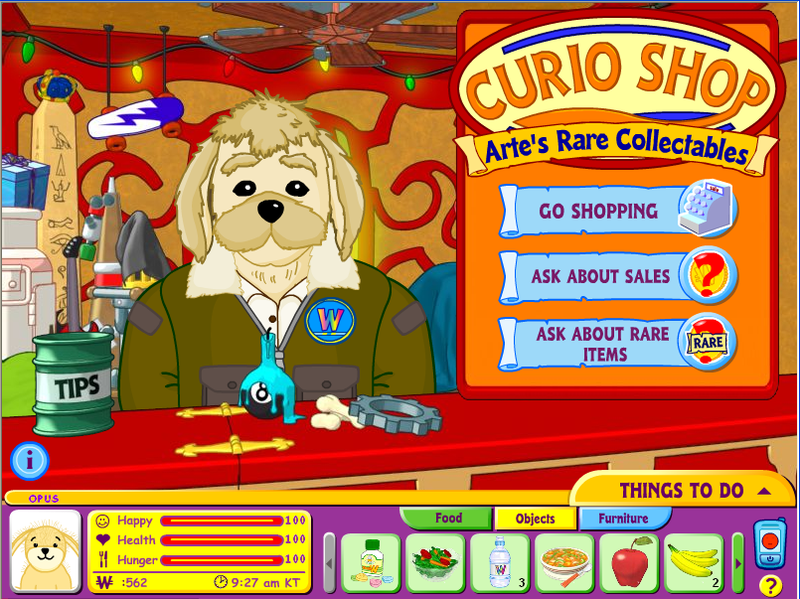 The Curio Shop is awesome, I check there many times a day. I have never tipped Arte, and he always tells me when the Rare Items will arrive. I have, however, bought a lot of Rare Items, so maybe that is why he tells me. I know this is off the topic but I was wondering if they are going to fix the glitch in The Clubhouse in the “Watch and Win” room? When you click on the screen we don’t receive the 25 coin anymore. I know they are usually working on the glitches. Any idea when? Thanks! Thanks for fixing the glitch! It’s working now. I always go to the same place to mine. Then I find which gem ‘sparkles’ and click on it. Once I get a gem one time, I go back to that same mine and spot where I found a gem. It’s no longer one color gem per mine – No, I get all colors from the same mine, clicking on the same spot. Hint: Try lower sparkle gems, too. The ‘sparkles’ have worked for me for 2 days. Thanks! But I’m still confused about the color gems being in specific mines. I still need a blue gem and a white gem to complete this crown. Should I only be looking in specific mines? Hi, I choose 3 rocks in a row and when the bottom of the rock sparkles I click on it. I don’t sell my gems if I already have them. When I get a crown I may only need one gem for the next one and the next one. Or maybe I only need 2 gems for the next crown because I saved them all! Each mine is home to various gems and each mine is also the only place you can find The main, most-valued gem of that particular mine. Buried Bones mine houses the Webkinz ‘W’ and is a good place to find all prismatic gems (but others of lesser value can be found in these mines, too) Howling Horse Mine is mine to all the Blue Gems and only home of the Ocean Sapphire. The Flea Floater mine houses all green Gems, but is the only Home of the Earth Emerald. The Muzzle Mouth Mine is Home to all the red gems and only home of the Ruby Heart And last, but not least is the Barking Mad Mine, Home of the Corona Topaz and all other yellow gems. As I said, earlier, other lesser valued gems are also available in these mines. Write down what you get in those mines and it won’t take you very long to figure out the most efficient way to Mine the gems you need for your Crown of Wonder. By the way, the presence of a spider or a bat seems to have something to do with finding a gem, too. I follow the bat and often find gems near where it disappears. The Spider usually means s gem is close by. I visit Arte much of the time, whether I’m shopping or gem mining. I am hoping you bring back the Swan Bed! I know Arte used to sell it, but then it was retired for good, and never came back, leaving me sad since I never got go buy it. One day? Oooh! I am so in for those themed rooms!! Kelly, I so agree with you! This way it gives you something special to work toward. If we get it all whenever we want it is no longer rare and we’d no longer need Arte. We already lost Debbie Dragon from the spa, I don’t want to lose Arte from the Curio Shop. That being said, I would really like to see him run for Mayor next election. Dixiecup, I understand that having the “rare” items gives us something special to work toward. But should it take years to even get that “rare” item? 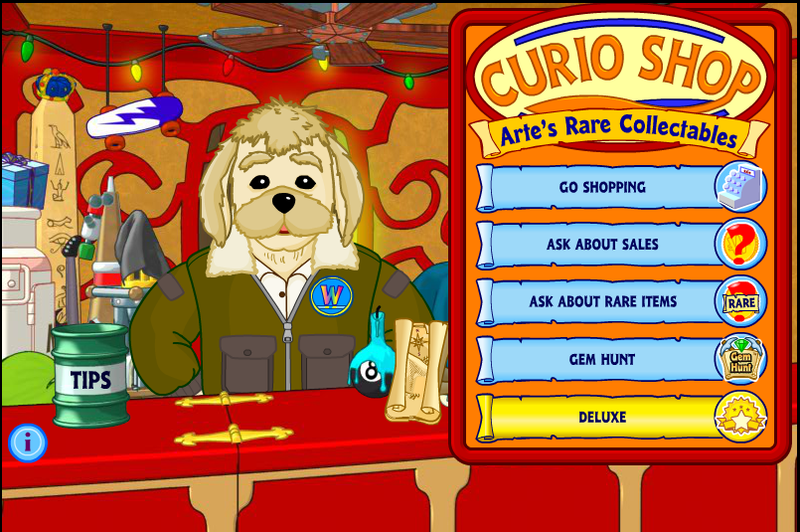 And how do we get some of the “rare” items that Arte never has in the Curio Shop? Like the ones you can “maybe” find in the trading cards. You know, the trading cards that you can never find in stores anymore. I use to buy the trading cards in places like Target, Cracker Barrel, and stores that sell lots of trading cards. Like the plushies, the trading cards are hard to find. Oh, yes, you can find them on ebay, but you run the risk of the codes already being used. Having the “Rares” accessible to all members wouldn’t put Arte out of business (seeing that he’s not a real live person anyway), he could just sell other items from the WShop or even the eStore that could be bought with regular KC. So…if no one in WW wants to make it easier for us to find, buy, and collect the RARE items we really want, how about creating some “Rare” Room Themes that could be bought with regular KC. Have an Ancient Egyptian Room, Medieval Room, Aztec Room, Wonderland Room, a Space Theme, etc, etc. 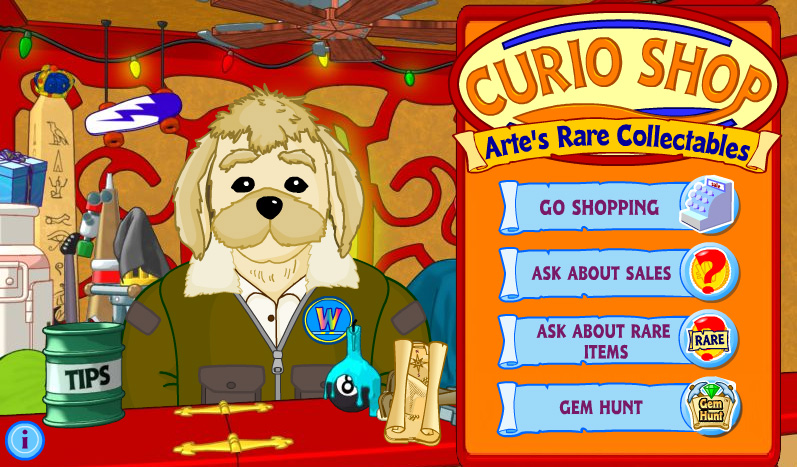 If Arte can’t have more Rare Room theme items, what’s the point of having the Curio Shop? He just has the same items over and over anyway. Maybe have a Rare Room item every hour? Every two hours? I’m tired of spending months, and years, trying to get the items I want! There is NO FUN in having to search and wait like that! As for Debbie Dragon, why not bring her back? And Dr. Quack? Have a small spa for all players to go to get a Happiness Boost, or a nice bath. Have Dr. Quack reopen his Clinic. It was actually fun taking our pets to see him. Even a check up when they aren’t “sick”, would be fun. If the creators of WW wants us to play and pretend in WW, then make it more fun, and fair. Make the Rare Room Themes available to all!!! Kelly989, yes…I know they are “Rare”, but that is not the point! This is a game! It is all virtual reality, not REAL life. There is no reason to have the coolest theme items be “rare”. They should have them where we could get them! Sometimes it takes YEARS to find an item you want. There is really no need to have RARE items in a game that is “supposedly” for children! I dare say more adults play this game than children. 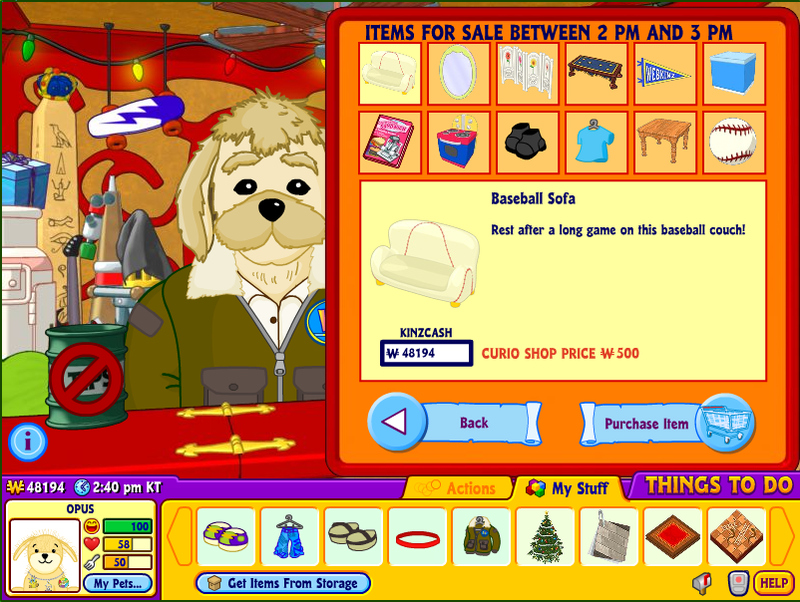 As an adult, if I want to spend my hard earned real cash on virtual items for “rare” items, then Webkinz should HAVE those items available for me to buy in Webkinz World! 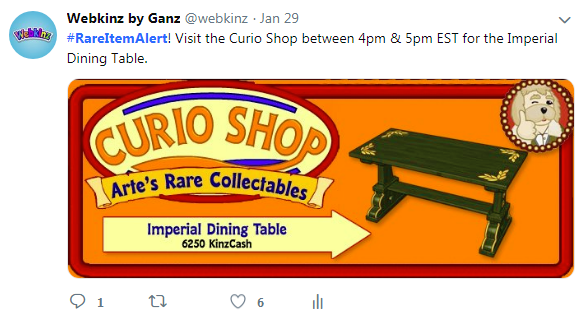 I shouldn’t have to hunt and wait for the items to “possibly” appear at the right time for the right price in the Curio Shop! I don’t sit at my computer 24/7. Besides, Arte seldom has the really so called “rare” items in his shop. How else can a person get a “rare” item they want? The whole concept of having “rare” items in a virtual game is really rather silly. RARE teaches children somethings are just a little harder to find and to cherish them a lil more , not to trade those, Last winter a newer person was in OPEN clubhouse room and wanted to trade me a Mad Scientist hair the whole outfit. I let them know I had paid for the outfit in the past . They needed to save it and accepted another item. I let them know the difference so they could look at rare items on line and not lose something. A little knowledge helps. Good thing they met me in an open chat room . And yes I have paid for the costume in the past but I just couldnt be mean and cheat them . NOW if it was GOBLIN FEET or ANGEL HALO I might have felt different I only have 1 of each. Well I’ve been friendly with Arte for many years. One day He just quit telling me the time that a rare item would appear. I sure miss that. I still visit him every day. Yes, I’ve been on good terms with Arte for years now. This report has been very helpful, because I wasn’t aware that I could fall out of favor with Arte, and that he could ever be ‘less enthusiastic’ to see me. Thanks for the tip Steve! I buy things from his shop regularly, and I visit him almost every day, so for now, things are fine. I have gotten really used to him telling me when to expect sale items and rare items, and find it very helpful. I do not have a twitter account, but that ‘rare item alert’ would be awesome, so maybe I’ll have to look into it. 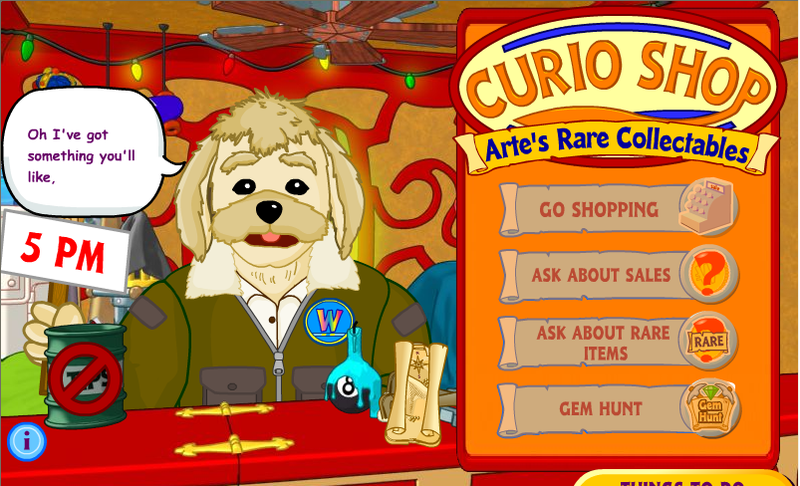 Here’s a question for Steve – who assists Arte in making sure that he cycles his inventory well, and periodically offers all of those wonderful items from the rare and curio shop themes listed above? I shop basically daily, and there are some items I see every day, and some items that I haven’t seen for months, and am eagerly waiting for (like one more space dining chair!) I would be happy to help Arte stay organized, if he’s hiring! Yes dogfish, you are correct. I am pretty sure that we are already friends in WW, but I don’t remember your username either. (Aren’t we a pair!) My UN is kalcan8. I remember that you’ve said that you like to hoard in WW. What do you collect? I have one friend who collects plushies, and another who collects PSFs, and I’m more of a furniture girl. Are your pets fashionistas, or do you just collect a little bit of everything? Hope you are having a great weekend! You are sweet and awesomely amazing! Thank you for the chair! I’m off to complete my icy mist leopard, Opal’s, space station room right now! Do you have 600 PSF because you have 600 pets, or because the foods have been gifted to you? Do you know if there is an article explaining step by step how the trade forum works? I went there once, and I didn’t understand it. If I say that I have one bake sale item, and I’m looking to trade for a different one, do I just check back, and then friend whoever responds, and then send them my item? Sorry, I’m just confused and need a ‘trade forum for dummies’ guide! No, sadly the dresser, earth table, and moon lamp were before my time in WW, or at least before I really started to figure things out. I used to miss a lot for about the first year, until I discovered WKN. I haven’t been missing those items though, because until Steve’s article, I didn’t even know that they existed. I am pretty pleased with how Opal’s room turned out. Wow! 500 pets! I have trouble keeping up with 35! LOL! Are they all plush, virtual, or a mix of both? (Does Webkinz even have 500 plush pets??) Have you been playing since the beginning? I’m pleased to know such a dedicated player! Dogfish, you are correct. As with the Cow jumped over the moon lamp and earth table, the Space Dresser has also been retired. Arte never has those items available. I prefer the plush, but I can rarely find them anymore. *sigh* I will sometimes comb through Amazon for deals, and then add a new webbie to my collection. But since Ganz seems to be discontinuing plush, everyone will be holding on to the ones they have and I won’t be able to get my hands on any. I had plans too. I am still looking for the perfect Harry, to sit on my shelf beside Ron and Hermione. And what will my faithful badger Samwise do without his Frodo. And don’t even get me started on Merry without Pippin. I don’t want to split up famous pairs/groups by having some be plush and some virtual. I’m not sure what I’m going to do. I’ll just have to keep hoping and searching. Congrats on being recognized for your hard work, dogfish! You should feel very proud of attaining honor student status! I had that happen too. He was telling me when rare stuff would be coming and then he just quit. Buy stuff every now and then, be sure to tip him generously too. I did that for about a week or so and then he started to tell me when rare stuff was coming again, right down to the hour. tuxkitty, just visiting Arte every day is not enough. You also have to buy things from him. I try to buy something from him almost daily, even if it is just a small item for 30 KC….every purchase counts. And try to tip him as often as you can. Again even if it is a small tip, it helps to keep him happy! Also, being a Deluxe member also helps to keep your status with Arte as a special customer! Hope this helps! GREAT Report Steve!!! 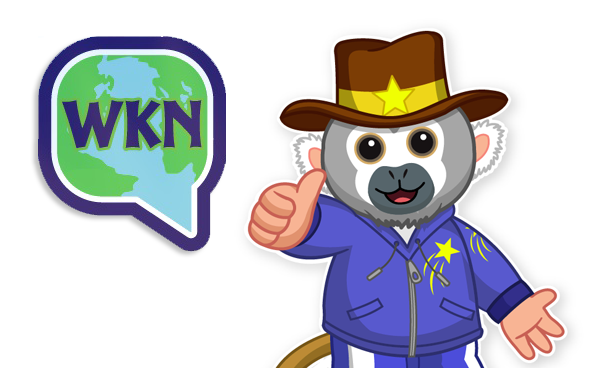 Thanks for all you do for us in Kinzville (especially behind the scenes) to make the town so enjoyable! I would like to nominate you for Kinzville’s next MAYOR ~ Do I hear a Second??? Always Appreciative! Just so everyone knows Arte takes about a month to become friendly so he tells you the time rare items are on. Great report, thank you Steve!